This tutorial aims at showing how to perform molecular dynamics with ABINIT using a parallel computer. You will learn how to launch molecular dynamics calculation and what are the main input variables that govern convergence and numerical efficiency. You are supposed to know already some basics of parallelism in ABINIT, explained in the tutorial A first introduction to ABINIT in parallel, and ground state with plane waves. This tutorial should take about 1.5 hour to be done and requires to have at least a 200 CPU core parallel computer. The basic idea underlying Ab Initio Molecular Dynamics (AIMD) is to compute the forces acting on the nuclei from electronic structure calculations that are performed as the molecular dynamics trajectory is generated. An AIMD calculation assumes only that the system is composed of nuclei and electrons, that the Born -Oppenheimer approximation is valid, and that the dynamics of the nuclei can be treated classically on the ground-state electronic surface. It allows both equilibrium thermodynamic and dynamical properties of a system at finite temperature to be computed. For example melting temperatures, phase transitions, atomic vibrations, structure factor… but also XANES or IR spectrum can be obtained with this technique. AIMD deals with supercells of hundred to thousand of atoms (usually, the larger, the better!). In addition Molecular Dynamics simulations can be performed for days, weeks or even months! They are therefore very time consuming and can not be done without the help of high speed and massively parallel computing. In the following, when “run ABINIT over nn CPU cores” appears, you have to use a specific command line according to the operating system and architecture of the computer you are using. This can be for instance: mpirun -n nn abinit < abinit.files or the use of a specific submission file. Before continuing, you might consider to work in a different subdirectory as for the other tutorials. Why not Work_paral_moldyn? In what follows, the name of files are mentioned as if you were in this subdirectory. All the input files can be found in the $ABI_TUTOPARAL/Input directory. You can compare your results with several reference output files located in $ABI_TUTOPARAL/Refs (for the present tutorial they are named tmoldyn_*.out). There are different algorithms to do molecular dynamics. See the input variable ionmov, with values 1, 6, 7, 8, 9, 12, 13 and 14. dtion controls the ion time step in atomic units of time (one atomic time unit is 2.418884 x 10-17 seconds, which is the value of Planck’s constant in hartree*sec). The default value is 100. You should try several values for dtion in order to establish the stable and efficient choice. For example this value should decrease at high pressure. Except for the isothermal/isenthalpic (ionmov 13) ensemble the input variable optcell must be set to 0. You have also to define the maximal number of timesteps of the molecular dynamics. Usually you can set the input variable ntime to a large value, 5000, since there is no “end” to a molecular dynamics simulation. You can always stop or restart the calculation at your convenience by using the input variable restartxf. The input file tmoldyn_01.in is an example of a file that contains data for a molecular dynamics simulation using the isokinetic ensemble for aluminum. Open the tmoldyn_01.in file and look at it carefully. The unit cell is defined at the end. It is a 2x2x2 fcc supercell containing 32 atoms of Al. ionmov is set to 12 for the isokinetic ensemble, and since ntime is set to 50, ABINIT will carry on 50 time steps of molecular dynamics. The calculation will be performed for a temperature of 3000 K, see the key variable mdtemp. It gives the initial and final temperature of the simulation (in Kelvin). The temperature will change linearly from the initial temperature mdtemp(1) at itime=1 to the final temperature mdtemp(2) at the end of the ntime timesteps. Here the temperature will stay constant during the whole simulation. Note that we use the same temperature for the ions and the electrons: occopt has been set to 3 for a Fermi-Dirac smearing and tsmear has been set to 3000 Kelvin. Nothing prevents you to use different electronic and ionic temperature, you just have to know why you are doing so! Molecular dynamics simulations are always large calculations, dealing with supercells of hundreds to thousands of atoms. Therefore they are always performed in parallel. In tmoldyn_01.in, paral_kgb has been set to 1 to activate the parallelisation over k-points, G-vectors and bands. The three following keywords give the number of processors for each level of parallelisation. Since we have only one k-point in the simulation (the \Gamma point), nkpt has been set to 1. npfft is set to 3 and npband to 10, for a total number of 3x10=30 processors. You might use the tmoldyn.files file. Edit it and adapt it with the appropriate file names. Then run the calculation in parallel over 30 CPU cores. You can change the distribution of processors over the level of parallelisation to try to find the most efficient one. Set for example npfft to 1 and npband to 40. You can make other choices and compare the individual cpu time. 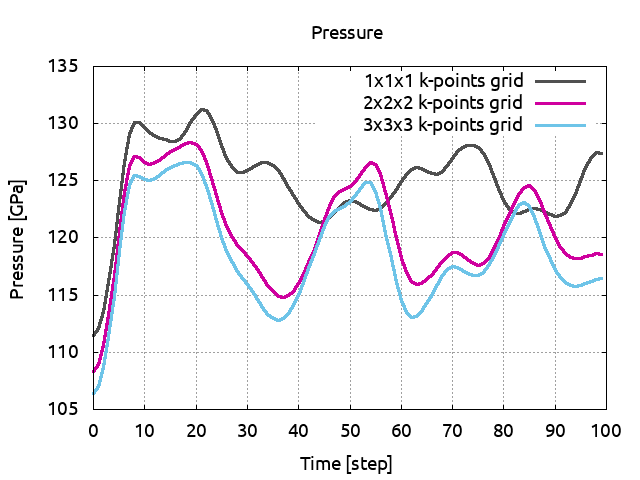 Since molecular dynamics can last for weeks, it is crucial to find the appropriate distribution to reduce the computational time at the maximum. Look at the output file. For each iteration you will see the coordinates, the forces, the velocities and the kinetic and the total energy. Since we already performed 50 steps of molecular dynamics, the total number of time steps are now 100. So the first 50 iterations are from the previous calculation. You can check that by comparing tmoldyn_01.out and tmoldyn_01.out0001. There is only one HIST.nc file and it contains the history of the two calculations. You can read (on standard output) the average value and the standard deviation of the total energy, the temperature and the pressure. You have also generated several files which contain pressures, energies, stresses, positions and temperatures. You can plot this files to observe the behavior of the quantities during the molecular dynamics. Note that 100 time steps is far from being sufficient to equilibrate physical quantities as pressure. 2000 or 3000 are more common numbers to reach this goal but it would exceed the time allocated for this tutorial. In the previous section you have learned to perform molecular dynamics with abinit. We used a fcc supercell of 32 atoms with only one k-point. In this section we will make convergence studies with respect to these parameters. The files tmoldyn_02.in and tmoldyn_03.in are input files for 2x2x2 and 3x3x3 k-points grid respectively, or 4 and 14 k-points in the irreducible Brillouin zone. As said previously our simulations are too short to be completely convincing but you can see that you need at least a 2x2x2 k-points grid for a 32 atoms cell. If you have some time, increase ntime to 300 and run again ABINIT. We also have to check if our cell is sufficiently large to give reliable physical quantities. In the previous section we used a 2x2x2 fcc supercell. tmoldyn_04.in is an input file for a 3x3x3 fcc supercell and therefore contains 108 atoms. nband and acell has been scaled accordingly to take into account the new size of the cell. Run now ABINIT in parallel over 45 CPU cores and then diag_moldyn.py (note that the output file is very big, and no reference has been provided for comparison). Save the pressure to PRESS04. tmoldyn_05.in has the same cell but a 2x2x2 k-points grid (note that the output file is very big, and no reference has been provided for comparison). Run it over the adequate number of cores and save the pressure to PRESS05. Plot now PRESS04 and PRESS05 and compare the average values. You will see that for this size of cell, the \Gamma point is sufficient. 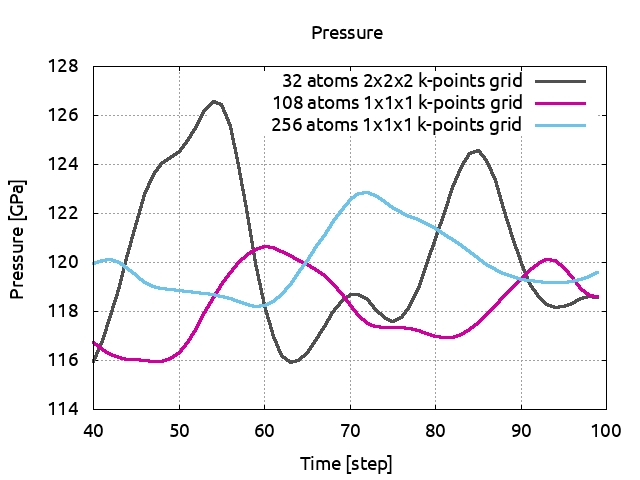 You can see that even if the pressure was converge in term of k-points, the 32 atoms supercell was not sufficient to give a reliable pressure. A 3x3x3 supercell with the \Gamma point seems to be the adequate size. You see also that with a bigger cell, the pressure fluctuations are considerably reduced. Note that here we made the convergence studies using the pressure as a criteria. The results can depend on the physical quantity you are looking at, pressure, temperature, energy, or dynamical matrices by observing the displacement fluctuations.... Always check if your cell is large enough and give the corresponding uncertainty. Also, to reduce the time necessary to do this tutorial we set the value of ecut to 3 Ha. This is too small, for Al, it should be closer to 8 Ha. As an example of what can be done in molecular dynamics, we are going to calculate the melting temperature of aluminum using the so-called Heat Until it Melts (HUM) method. In this method the solid phase is heated gradually until melting occurs. Let us start with a temperature of 5500 K.
An example of file is given with tmoldyn_07.in. To work fast, we use a 32 atoms supercell and the gamma point (note that the output file is very big, and no reference has been provided for comparison). Run ABINIT in parallel over 30 CPU cores and then diag_moldyn.py. Save the pressure to PRESS71. Plot the atomic positions, you see that at this temperature, the cell is solid. Increase the temperature to 6000 K (do not forget to also change the electronic temperature with tsmear) and run ABINIT. Save the pressure and again, look at the positions. The cell is still solid. You can clearly observe a discontinuous change in pressure due to the volume difference between the solid and liquid phases. This give a melting temperature of 6250 K at 149 GPa. 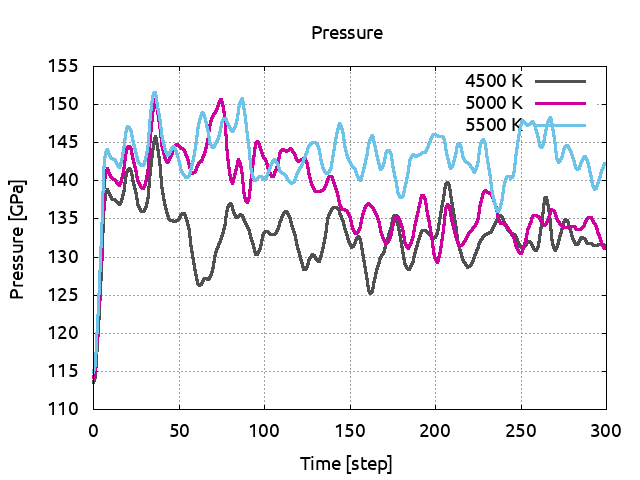 With more sophisticated techniques the melting temperature at this pressure is around 5500 K. Indeed, in addition to the crude parameters we used (ecut, natom…), the HUM method has some intrinsic drawbacks. In HUM the crystal is heated homogeneously, the melting initiates in the bulk and this results in an overheating effect.